This is by far my most favorite artistic project! 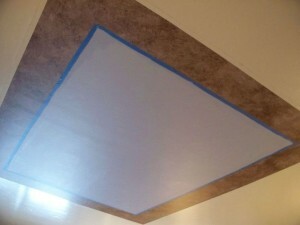 In our home in the mountains of Idaho, we had a 27 foot bedroom, which also meant a 27 foot blank ceiling! As I lay in bed one morning, staring at that massive ceiling, I got the bright idea to give it something so spectacular! Something that would just knock the socks off anyone who ever saw it (and trust me, it DID!). 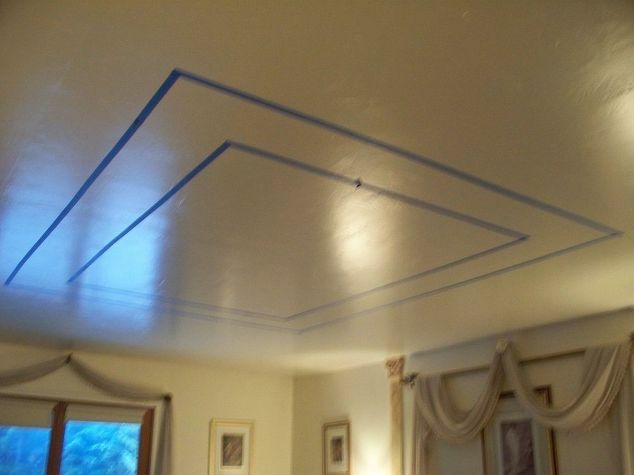 I found the center of the ceiling, then measuring from the walls inward, equal distances away from the walls then taped off a big rectangle with a smaller rectangle inside. 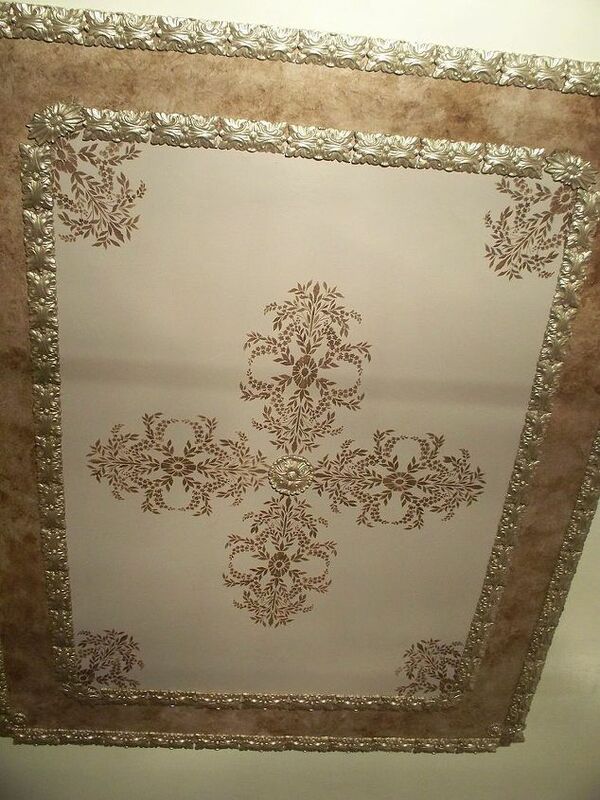 I then painted that frame a tan color and sponged a brown glaze over the top to create a mottled color effect. Finding the center of the frame and snapping chalk lines, I used our Raised Plaster Floral Medallion Stencil in a repeated fashion to create a large medallion right in the center. Pre-tinting the joint compound with brown paint helped to save me time later in trying to paint the white design. I used the same design in the corners facing the center of the frame. Using plaster of paris, I cast our Oasis Plaster Mold over and over to create the pieces you see around the frame. In the corners, I cast our our Floral Medallion Mold and Grape Leaves Mold as fill in pieces. That beautiful ceiling frame helped sell the house two years later. Now I’m considering doing one on the bedroom ceiling in the house I currently own in New Mexico. 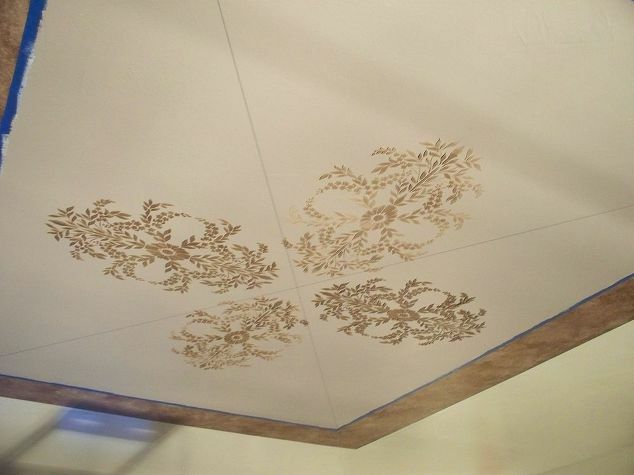 Check out all of our Plaster Molds and Plaster Stencils and let your imagination help you decide how to give your home an exciting new look! There’s no end to what YOU can do!